Cotton jersey fabric is knitted with interlocking loops of yarn making it stretchy. It’s different from a woven fabric where the yarns crisscross perpendicular to each other. Jersey, made from cotton, is normally a fine single knit with an obvious right and wrong side but different knit constructions can produce a double faced fabric, like scuba, which is more stable with less stretch. The cotton fiber may be used on its own or mixed with spandex (Lycra) to improve the stretch and recovery of the fabric. 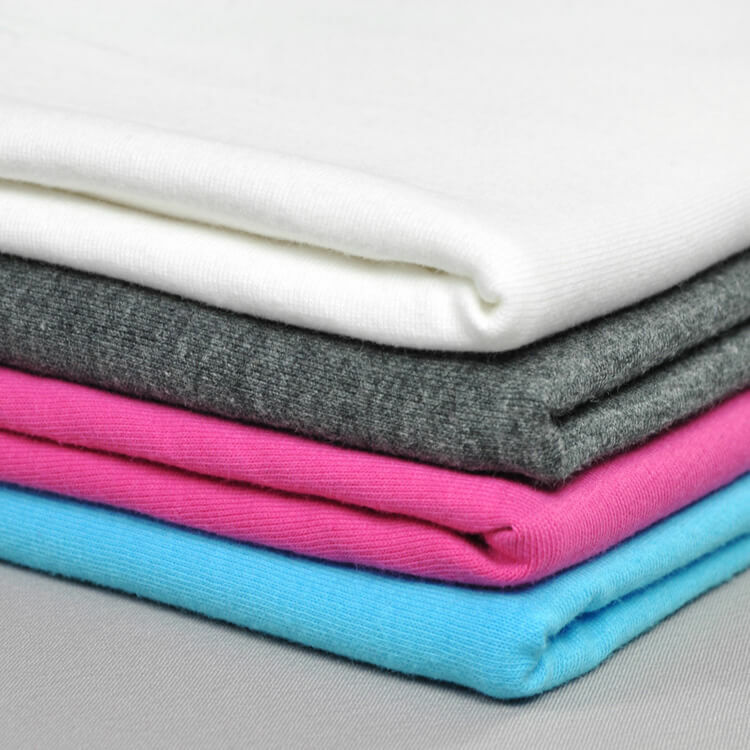 The stretch properties of cotton jersey make it ideal for T-shirts, tops, nightwear and underwear. It drapes nicely so it is perfect for dresses and skirts too. Cotton jersey is available in many solid colors. 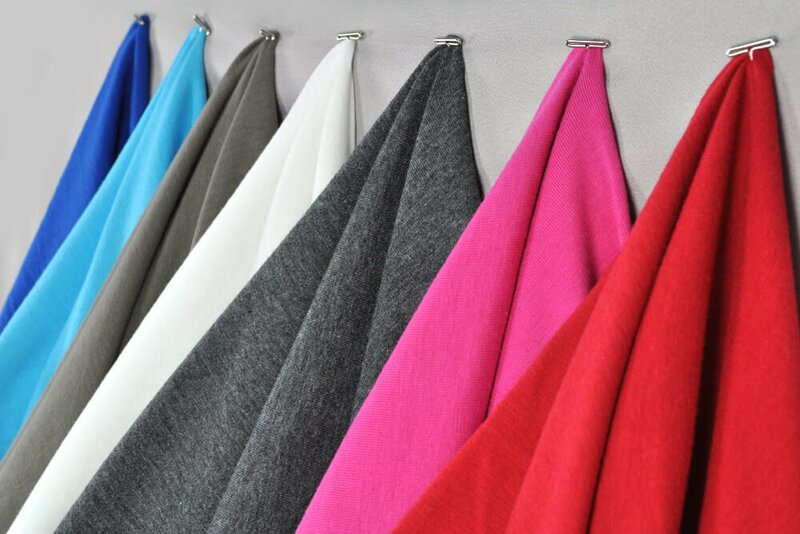 The basic cotton jersey is 92% Cotton, 8% Spandex and 6.2 oz per square yard. Robert Kaufman Laguna Cotton Jersey fabric is 95% Cotton, 5% Spandex and is a little lighter weight at 5.4 oz. Jersey is also available in prints by Riley Blake. Want to get the printable PDF product guide? Sign up to our mailing list to download the PDF. Sign Up Here! Cotton jersey has a tendency to curl at the edges causing problems when cutting. This can be reduced by ironing a spray starch over the sides before laying out for cutting. Sometimes curling the edge is desirable. Jersey is great for creating no sew strands of fabric because the edges roll and don’t fray. Cut narrow strips of fabric and stretch them lengthwise to roll the edges. Ballpoint needles are good for sewing cotton jersey but if it is a high stretch jersey, containing Spandex (Lycra), consider a stretch needle as this will prevent skipped stitches. Select the size to match the weight of the jersey – 65/9 for lightweight and 90/14 for coarser, heavier weight knits. Or use a stretch double needle for hemming (see techniques below). Use good quality polyester thread when sewing jersey. Even though cotton matches the fiber content, stitches in polyester thread move with the stretch of the fabric and will produce smoother seams than cotton thread. Use a stretch stitch so your seams move when the fabric stretches to prevent broken threads. Most modern sewing machines have pre-programmed stretch stitch options but a narrow zigzag stitch will also work. Try these on spare fabric before starting your garment. 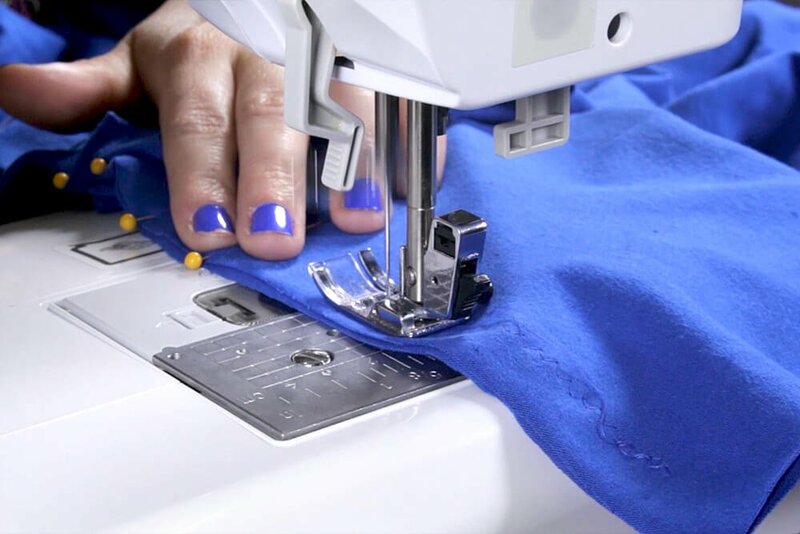 Use a serger with four threads to sew cotton jersey seams for a quick result and a good finish. If this isn’t possible, sew seams with a stretch stitch and finish the raw edges with a zigzag or machine overcasting stitch. Some jersey fabric may not need to be finished as they do not ravel or fray. Manufactured T-shirts are generally hemmed with cover-stitch machine. This shows two parallel rows of straight stitch on the surface with a serged stitch on the wrong side. If you do not own a cover-stitch machine, a similar effect can be created with a twin needle (see techniques below). 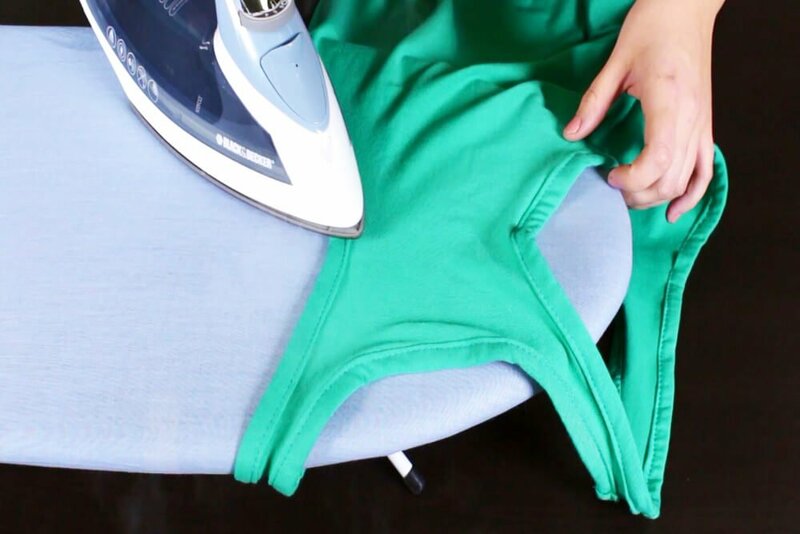 For 100% cotton jersey, use a hot steam iron, but if necessary, protect the surface with a pressing cloth. Reduce the heat of the iron for a cotton/spandex blend jersey. If the cotton jersey permanently stretches while you sew, control the fabric using a strip of tear away stabilizer beneath the seam while you sew. Sew through the seam and stabilizer then carefully rip away the stabilizer when you finish. A serger produces a perfect seam for sewing any stretch fabric panels together because the way the stitches are formed allows the fabric to stretch and move without causing the threads to break. Follow the instructions in the machine’s manual and thread up both needles and loopers. Make sure the tension dials are all at the same setting and choose 2.5mm to 3mm stitch length. Test the stitch on some spare fabric and if the seam puckers, reduce the differential feed to a lower number. Sew your panels together when you are satisfied with the result. If you don’t own a cover-stitch machine but you need a hem to move with the stretch of a cotton jersey fabric, fit a 4mm stretch double (twin) needle to your sewing machine. Feed two reels of thread through the guides and eyes of the needles and fill the bobbin with the same thread. Fold up the cotton jersey to the required hem and sew from the right side of the cloth approximately ½” (12mm) from the hem edge. When completed, turn over and trim away the excess up to the zigzag stitching on the underside. This creates a similar effect to a manufactured finish and allows the hem to move when the garment is being pulled on and off without breaking the threads and stitches. Store bought T-shirts are often finished with a neckband rather than a facing or binding so that the neck can stretch when it is pulled on and off. This is easy to recreate on a domestic sewing machine. Measure the neck circumference and cut a length of fabric to match by double the depth (with seam allowances added). Make sure the stretch of the fabric will lie around the neck band. Sew the band into a circle and fold in half so that the wrong side and the raw edges are enclosed. Place the neck band to the neck edge so that three raw edges are level and the band is on the right side of the T-shirt. Pin and then sew the band to the neck edge using a stretch stitch on the sewing machine. Finally, press the raw edges to the inside of the T-shirt and top stitch with a 4mm twin needle as with the cover stitch method above. No one will ever guess you made your T-shirt! Click here to shop our wonderfully versatile range of cotton jersey fabric. Do I need to use stablizer when I add a bound opening into a cotton single knit cotton knit gown.? The opening is to allow access to an insulin pump. I plan to bind the opening similar to a bound button hole. BEST ANSWER: It will likely work well without stabilizer. What is the best to use for baby/toddler clothes? What is the best fabric to use to make active pants?